While we’re here in Bozeman, Montana, trying to outlast winter before heading back on the road, we decided to take a road trip to Yellowstone National Park. 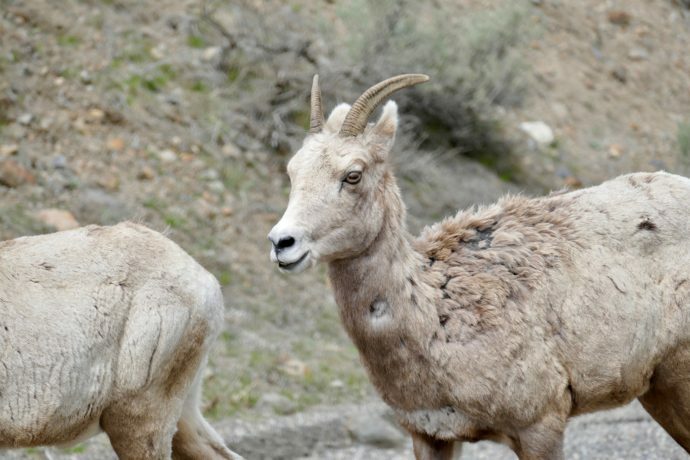 We’d read about Yellowstone National Park’s “Spring Babies” in their April newsletter and wanted to see what wildlife was out and about. We know you’re thinking, “Why aren’t you fishing there?” Fishing inside the park is not allowed until the Saturday of Memorial Day weekend each year. 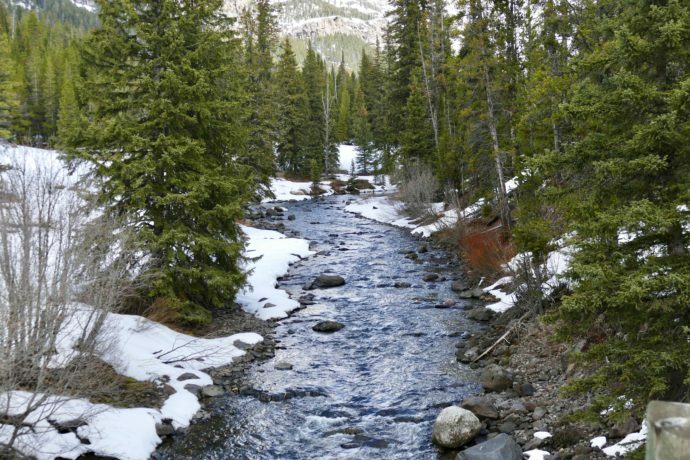 And… we will be fishing in YNP several times this summer along Slough Creek, Soda Butte, the Lamar and Yellowstone Rivers. No… this trip was about seeing what wildlife might be found. At this time of year, the only road open into YNP is through the North Entrance at Gardiner, MT. Nothing other than a small general store is open in the YNP Mammoth Hot Springs area. This road is kept open to a small Montana town, Cooke City, which is a snowmobiler’s dream in winter and it’s the only road open to the town. Beartooth Pass from Red Lodge, MT, is closed for winter as is the road from Cody, WY to Cooke City. Cooke City is also the gateway town to YNP situated just outside the Northeast entrance to the park. So off we went, picnic lunch packed, headed to Yellowstone. When we went through the North Entrance to the park, we picked up an Interagency Senior Pass for Barb. If you are 62 or over, go online (extra $10) or to your nearest national park and get one of these NOW! Why? Today, its $10 for a lifetime pass. Sometime later this year, it’s going up to $80. I know I digress, but these passes save you a ton of entrance fees AND give you access to the most special places anywhere, our national parks and monuments. 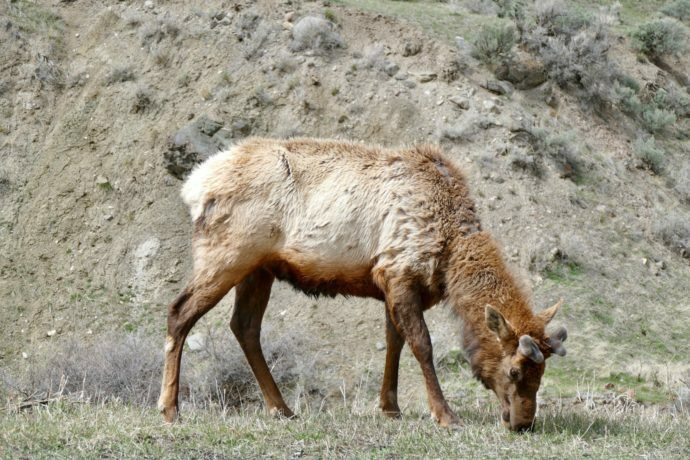 As we drove into the park, we saw the usual elk grazing on both sides of the road, along with a bison here and there. The steep climb up the road to Mammoth which follows the Gardiner River didn’t reveal any new wildlife. At Mammoth Hot Springs, the smell of sulfur and the beautiful yellow of the hot springs reminded us of why we love this park so much. We headed the only way we could, toward Tower Junction and onward toward Cooke City. We have a favorite picnic spot along this stretch of park road, and while it was too early for lunch, we still had to stop and take in the view. Normally, we set up our camp chairs and chow down on our gourmet lunch of a PB&J with some chips and a cookie. This day, we took our first photo which is the one featured on our splash page of this post. Along the road, we saw the “Spotters” out looking for bears and wolves. You know them by their big telescopes, lenses and the antenna on their cars and trucks so they can stay in touch with other “spotters” in the park. Often, you’ll see a dozen or more of them, lined up at spots just looking out into the park, hoping to get a glimpse of movement and find their prey. We’d not seen anything so we rambled on toward Cooke City, driving along the Lamar Valley. When we started to encounter significant snow on the ground and one of our fav pullouts to have our lunch was closed due to snow, we turned around. As we passed back over Soda Butte, one of our favorite fishing spots of all time, we snapped a picture of it with banks still covered in snow. 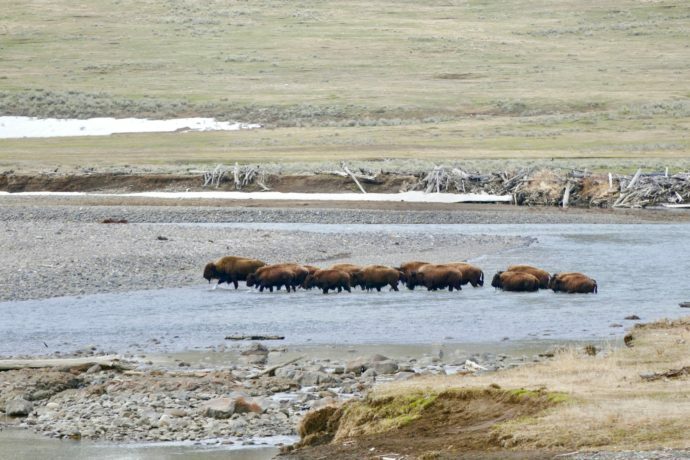 As we passed back through the Lamar Valley, we decided to stop for lunch and watch the herds of bison grazing and roaming. One herd decided it was time to cross the Lamar while we were having lunch (see Pic 2). It must have been time for them to move to greener pastures. As we left our lunch spot and headed back toward Tower Junction, we spotted a small “jam” of cars, with numerous “spotters” so we stopped to see what they were looking for. It was a bear of course but it had moved out of sight. We decided to move on and right before we were set to cross the Yellowstone River, a small herd of Big Horn Sheep came out of nowhere and decided to cross right in front of us. We snapped numerous pictures but posted Pic 3 above, as it shows something that is also prevalent in spring, wildlife shedding its winter coats. While we really didn’t see many “babies” on our road trip, we did notice all the animals already shedding. 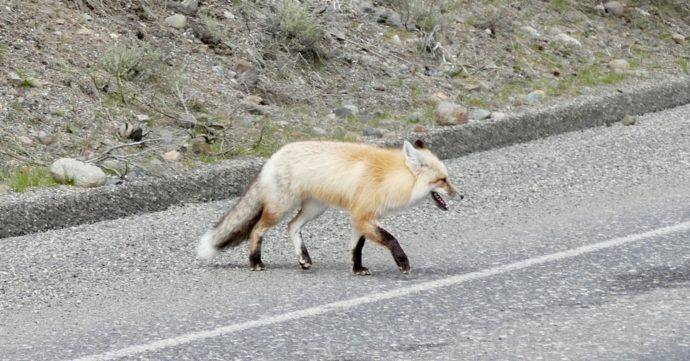 While we were still parked on the roadway, watching the sheep, a red fox trotted across our path (see pic 4). When we went back to Tower Junction,we encountered another “jam” filled with “spotters”, but this time, there was a black bear far up on the hillside. Before I could get our camera out, lens cap off and focused, it had disappeared into the forest. We stayed there for another 15 minutes hoping it would reappear, but not this time. As we were leaving the park, I’d mentioned to Barb that we’d not taken any pics of elk. Lo and behold, as were were driving back down from Mammoth Hot Springs to Gardiner, we saw this elk (pic 5) snacking beside the road, showing off his “rack in progress” and keeping with the theme of wildlife, his winter coat shedding. As we left the park, we remarked, “this doesn’t ever get old”. We go into YNP whenever we’re out in Montana. It draws us back again and again. Its vast expanses. Its amazing wildlife. Its beautiful rivers full of cutthroat trout. And yes, we’ll be back in July! We had an awesome week fishing, hiking and touring Yellowstone National Park. We stayed at the Madison Campground inside the park. It was just a short hike to both the Gibbon and Madison rivers. The week started with a great guide trip with Patrick Daigle of Blue Ribbon Flies (West Yellowstone, MT). We fished the Madison, Gibbon and Firehole rivers with Patrick and got a great feel for fishing by swinging wet flies for big fish that were moving up the Madison from Hebgen Lake to spawn. Our typical plan in an area is to go out with a guide on our first day and then fish on our own the next few days. In this case, the day after our trip with Patrick, we awakened to white stuff dropping from the sky…. SNOW! The temp outside was in the mid-20’s. We’d accoustomed ourselves to fishing in the 40’s and even in the 30’s as the temp was during our day fishing with Patrick. However, the mid-20’s was something else. So…. we made a decision….. SNOW DAY! We took off from the campground about 9am and didnt return until dusk. It snowed on us all day but made the landscape of YNP so beautiful. We hope you enjoy this narrated video of our “Snow Day” touring Yellowstone National Park.